Located on the shores of scenic Loch Fyne, Minard Castle is the perfect romantic venue for your wedding at a Scottish castle. You can choose an outdoor setting either in the castle gardens, on the lawn, or overlooking the Loch. A marquee is recommended for your ceremony and reception, in case of wet weather! 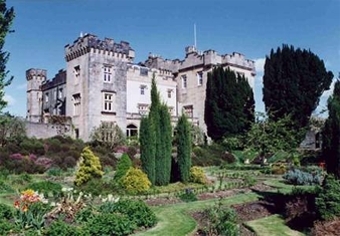 Minard Castle is not a hotel, so outside caterers are needed for the reception. Please note that no accommodation or other facilities are available inside Minard Castle itself. We can recommend a professional co-ordinator either to assist you with details or to organise your entire event, but we do not offer catering or wedding organising services ourselves as Minard Castle is a small family concern and we do not provide an in-house weddings organising service, nor can we offer a range of "wedding packages". Catering, drinks, wedding cake, flowers, music, photography and kilt hire are all available locally, and we can recommend suppliers. A deposit of fifty percent of the Venue Fee for the Ceremony and Reception, must be paid at the time of booking. The balance is payable four weeks before the date of the ceremony. An additional deposit of �0, payable at the time of booking, is required against any damage or loss, but if there have been no such problems this will be refunded. Payments may be made by cheque drawn on a British bank and made payable to R. Gayre. Please ask if you need another way to pay. Deposits are not refundable unless the chosen dates are unavailable, in which case payments will be returned at once. However, if sufficient notice of a cancellation is given, and we are able to re-book the venue to someone else for the same date, we will refund the payment. Any costs incurred by us will be deducted from the amount refunded. We recommend that guests take out insurance to cover their costs in the event that they have to cancel. We try to be considerate and understanding about cancellations or date changes, as we would rather have satisfied customers than ones who feel they have been exploited! We regret that we do not have any brochures to send you. If you would like more information than is given on this website, please ask and we will be glad to answer your questions. You would be very welcome to pay us a visit, and we will be glad to meet you and show you the Minard Castle grounds ourselves. If you would like to visit us, please just let us know when you might be coming, in order to be sure we will be available on the day. Please just ask if we can answer any questions for you. We find that every couple's requirements are different and we would be happy to discuss your wedding plans with you.